I came in with Halley's Comet in 1835. It is coming again next year, and I expect to go out with it. It will be the greatest disappointment of my life if I don't go out with Halley's Comet. The Almighty has said, no doubt: "Now here are these two unaccountable freaks; they came in together, they must go out together." It was not the first of his predictions or premonitions, nor his first association with the stars. A month before his brother Henry's death, Twain saw the event in a dream. He was haunted ever afterward and became interested in the paranormal. He was even an early member of the Society for Psychical Research (according to Wikipedia). As I write this, the figure of Orion is hanging sideways in the late autumn sky: Mark Twain's lone surviving brother shared that name and taught him the trade of the printer and journalist. Today a humble asteroid bears the name "2362 Mark Twain." Anything that might be said about Mark Twain has probably already been said in one way or another. I can offer a few words about his career as an author of weird or fantastic fiction. His story, "A Dying Man's Confession," was reprinted in the pages of Weird Tales (Oct. 1930) almost two decades after his death. His previous works in the field included a story of time travel, A Connecticut Yankee in King Arthur's Court (1889), and one of Satan on earth, The Mysterious Stranger (1916). 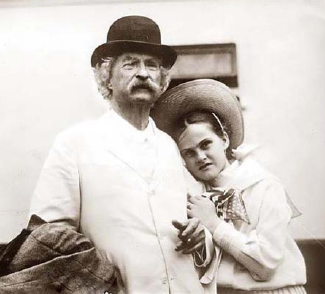 Finally, in his old age, Twain befriended a girl named Dorothy Quick (1896-1962). After Twain's death, her own writing career in full swing, Dorothy authored fifteen short stories and twenty-five poems for Weird Tales, making her one of the most successful of contributors to "The Unique Magazine." If you live to be an old man you will see it again. It will come back in seventy-five years. Remember, I will be gone, but you will see it. All that time it will be traveling in the dark, but somewhere, far out there, it will turn back. It is running glittering through millions of miles. Remember, all you have to do is to be careful and wait. You will be seventy-eight or seventy-nine years old. I think you will live to see it--for me. Eiseley's father of course did not live to see the return of the comet. Sadly, neither did his son. But Loren Eiseley went on to a celebrated career as an anthropologist, teacher, and philosopher, and as a fine literary stylist. Ray Bradbury was an admirer of his work, and as it turned out, Eiseley even tried his hand at science fiction. I would not be surprised to learn that he had once been a reader of weird tales. If I calculate correctly, Halley's Comet is now about halfway between perihelion and aphelion, huddled in its blanket of ice in the deep cold of interplanetary space. What writer, born at about the time of the comet's last approach to Earth in 1985-1986, will make his or her name as Mark Twain and Loren Eiseley did before it returns? If you want to read about Mark Twain, the place to start might be his autobiography, published last year, a century after his death. Mark Twain and Dorothy Quick, two contributors to Weird Tales, though neither could have known it when this photograph was taken in July 1907 aboard the U.S.S. Minnetonka. Descended from radio drama, Alfred Hitchcock Presents (1955-1962) and The Twilight Zone (1959-1964) paved the way for anthology series on television. The Outer Limits (1963-1965) was probably the most well known of the anthology series to come along in the early 1960s, but there were others. Hosted by Boris Karloff, Thriller (1960-1962) combined tales of crime with tales of fantasy and horror. That uneven mix is blamed for the short run of the show. Nonetheless, Thriller benefitted from a first-rate assembly of writers, including Robert Bloch, Richard Matheson, and Charles Beaumont. The show's casts read like a who's who of television and movie stars and character actors: Mary Astor, MacDonald Carey, John Carradine, Oscar Homolka, William Shatner, Leslie Nielson, Everett Sloan, Cloris Leachman, Mary Tyler Moore, Mort Sahl, Robert Vaughn, and many, many more appeared on Thriller during its two-year run. 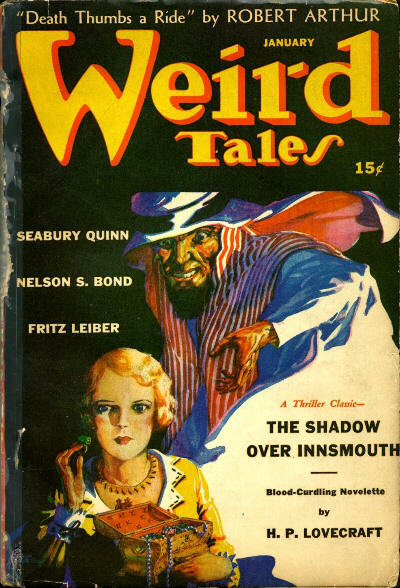 Thriller drew many of its stories from pulp fiction, including weird tales by Robert Bloch, Robert E. Howard, August Derleth, Mary Elizabeth Counselman, and Margaret St. Clair. In their book, Fantastic Television (1977), authors Gary Gerani and Paul H. Schulman give special attention to adaptations of "The Cheaters" by Robert Bloch and "Pigeons from Hell" by Robert E. Howard, calling "The Cheaters," "one of the finest horror tales ever aired." The host and a sometime cast member of Thriller was Boris Karloff (1887-1969). Karloff had of course made a name for himself as the monster in Universal's Frankenstein (1931). He played in many more horror and fantasy films over the years, including four low-budget Mexican productions released after his death. His role as a horror host was an interesting one. Karloff hosted three horror/fantasy TV series altogether. The first, called The Veil (1958), consisted of only twelve episodes and never aired, while the third, Out of This World (1962), was made for British television and lasted only thirteen episodes. Thriller, with 67 episodes, was more successful. It's hard to say what ingredients went into the mix, but the horror host appears to have been a character type developed for 1950s television. According to Wikipedia, Vampira, played by Maila Nurmi and based on Charles Addams' cartoon femme fatale (later named Morticia), is accepted as the first TV horror host. She began her career on KABC-TV in Los Angeles in 1954. Soon, with the release of packages of horror movies into syndication, horror hosts were raising their ugly heads everywhere on local television. (Sammy Terry played the part in Indianapolis where I grew up.) But what was the origin of the horror host? You can make the case that comic books beat television to the punch with such characters as the Crypt-Keeper, the Vault-Keeper, and the Old Witch from EC Comics. Thriller inspired a return to comics for the horror host. 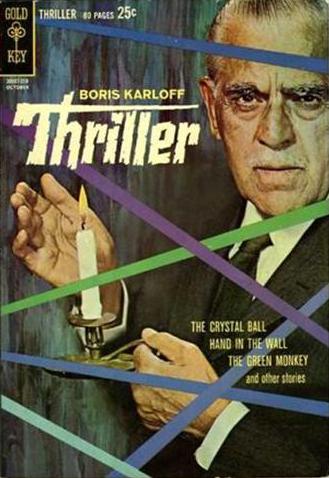 In October 1962--after the last television episode upon which it was based had aired--Gold Key introduced Boris Karloff Thriller, an 80-page comic book with Karloff's picture on the cover. 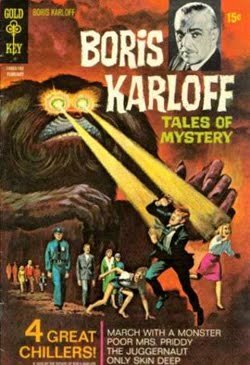 After only two issues, the book was retitled Boris Karloff Tales of Mystery and ran for 95 more issues, finally to give up the ghost in February 1980. By then few would have remembered the television show that gave rise to the comic book. In any case, here's a list of Thriller episodes based on stories from Weird Tales. There may be omissions: some episodes sound suspiciously weird--by title, author, or plot--but I couldn't make a definite connection to "The Unique Magazine." If anyone has any changes to make, feel free to submit them. 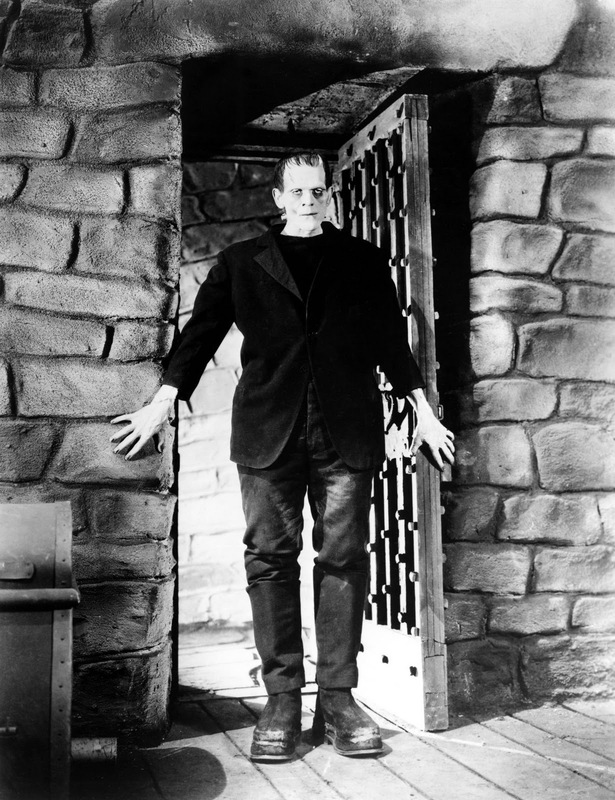 Boris Karloff as the monster in an iconic still photo from Universal Pictures' Frankenstein (1931). The story that inspired the movie, written by Mary Wollstonecraft Shelley, was serialized in Weird Tales in May-December 1932, probably to capitalize on the release of the film. According to the Internet Movie Database, the premiere of Frankenstein occurred on November 21, 1931, making today the eightieth anniversary of the movie monster. Happy Birthday, Frankenstein's Monster! Nearly three decades later, Karloff began his stint as host of Thriller, an NBC-TV anthology series of crime and horror stories. Here's the cover of the first issue of Gold Key's comic book adaptation of the show, released after the last episode had aired. The title of Thriller was changed to Boris Karloff Tales of Mystery after the first two issues. Gold Key was known for its great painted covers, not only for this title, but also for Dr. Solar, Star Trek, Space Family Robinson, and others. Boris Karloff Tales of Mystery ran until 1980. Finally, a still from the Thriller episode "Pigeons from Hell" by Robert E. Howard, a story that first appeared in Weird Tales in May 1938. The photo is from the book Fantastic Television by Gary Gerani and Paul H. Schulman (1977). Minnie Lorena Faegre Knox was born on April 20, 1886, in Flandreau, South Dakota, daughter of a banker and granddaughter of Norwegian immigrants. 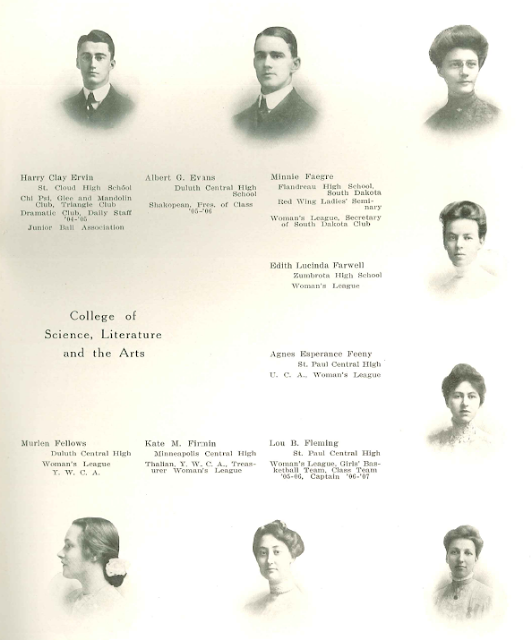 She received her post-secondary education at the University of Minnesota (graduating in 1908) and the College of Physicians and Surgeons in New York City. In 1909 she married a man named Walter Knox Kutnewsky in Flandreau, South Dakota. The young couple settled in Aberdeen, where Kutnewsky managed a newspaper. In 1916, the Kutnewskys lived in Seattle. By 1920, Walter Kutnewsky had secured a position as a government clerk in Washington, D.C. Ten years later, the couple lived in Oakland. They may have spent the rest of their lives in the San Francisco Bay area. Somewhere along the line (between 1920 and 1930), Walter Knox Kutnewsky changed his name to Walter Kincaid Knox. Minnie adopted the name as well. Knox also joined the U.S. Army, eventually earning the rank of colonel. In 1930 he gave his occupation as insurance broker. As a member of the U.S. Army Reserves, he may have been stationed at The Presidio or another Bay-area installation. In any case, his wife, Minnie Faegre Knox, wrote poems and plays and joined clubs in the area. She was an editor of the California Writers' Club and a member of the Woman's Club of Berkeley and the Daughters of the American Revolution, among others organizations. Minnie wrote just one poem for Weird Tales, "Claire de Lune," published in May 1928. Colonel Walter Kincaid Knox died in 1962 at age seventy-eight. Minnie L. Faigre Knox died on December 12, 1980, at age ninety-four. Both are buried at Golden Gate National Cemetery in San Bruno, California. An Internet search of Minnie Faegre Knox or Mrs. Walter Kincaid Knox results in a few newspaper articles on her club activities. I could find little else of interest on her. A page from The Gopher, the yearbook of the University of Minnesota, in the year that Minnie Faegre graduated with a bachelor of arts degree, 1908. Her photograph is on the topmost right. Image courtesy of the University of Minnesota Archives, University of Minnesota-Twin Cities. Thanks to Randal Everts. Thanks to Randal Everts for finding Minnie Faegre Knox's middle name. Harry Irving Shumway was born on October 22, 1883, in Naugatuck, Connecticut, and appears to have lived in New England his entire life. In 1910, he was in Medford, Massachusetts, with his parents. In 1917 and 1920, Boston was his home. By the time he filled out his draft card in 1917, Shumway was working as an artist and writer for House Beautiful magazine. Over the next decade and a half, he wrote stories and pieces for American Boy, American Cookery, Boy's Life, The Christian Science Monitor, Collier's, Life, Munsey's, The Popular Magazine, The Saturday Evening Post, and Youth's Companion. His one work for Weird Tales was the story "Golden Glow" in the magazine's second issue, April 1923. By 1930, Shumway was living in Quincy, Massachusetts, and in 1942, he was a self-employed writer in Bridgewater, Massachusetts. Shumway was also an author of books. They included Famous Leaders of Industry: The Life Stories of Boys Who Have Succeeded, a series by Edwin Wildman, Trentwell Mason White, Harry Irving Shumway, and Joseph A. Moore (1920); The Wonderful Voyage of Cap'n Pen (1929); The Story of Paper (1932); Bernard M. Baruch: Financial Genius, Statesman, and Advisor to Presidents; Lawrence the Arabian Knight: Being the Life Story of Thomas Edward Lawrence (1936); Albert the Soldier-King: Being the Life Story of Belgium's Beloved Ruler; and War in the Desert: The Story of Lawrence of Arabia (1938). Harry Irving Shumway died in Laconia, New Hampshire, in August 1974. Update (June 9, 2014): See the comment by Shumway's granddaughter, Cynthia DellaPenna, below for more information on the author and his life. Glims by the way are lights. And Shumway's wife was named Letitia Frances Valentine. 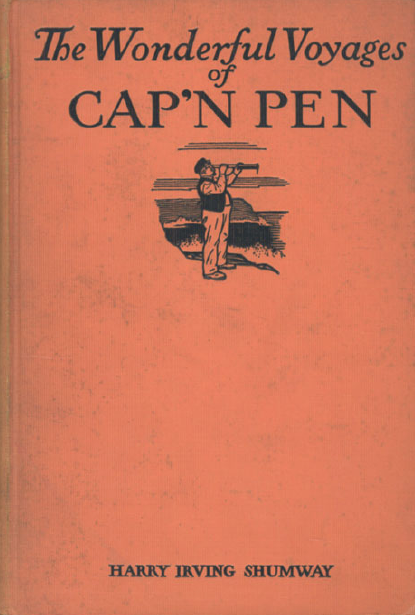 The cover of The Wonderful Voyages of Cap'n Pen by Harry Irving Shumway (1929). The illustrator for the interior was Frederick Strothmann (1879-1958). I assume the cover illustration is also his. Shumway's book is a collection of seventeen fantastic tales told by the title character. One of those tales involves a trip to the moon. Note: In a letter to Weird Tales researcher Randal Everts, Harry Irving Shumway's daughter gave October 2 as Shumway's birthday. I have used the date given in other sources. Who Wrote the Most Letters in Weird Tales? "The Eyrie," the letters column and editorial department for Weird Tales, began with the first issue in March 1923 and continued through most of the magazine's run until September 1954. Hundreds of correspondents wrote to "The Eyrie," including most of the magazine's more prolific authors. H.P. Lovecraft for example was published in the letters column (in September 1923) before having his first story, "Dagon," in the main body of the magazine (in October 1923). Lovecraft wrote twelve letters published in Weird Tales. That's a bit of a surprise considering he was one of the most prolific writers of letters in human history. The champion letter writer in Weird Tales was the so-called "Big Name Fan" Jack Darrow, a Chicagoan referred to more than once as a "letterhack." And he did hack out a few letters, 35 to Weird Tales, six to Oriental Stories, and three to The Magic Carpet Magazine. Next is the unknown B.M Reynolds with 33. If B.M. was a man, then the most prolific of women correspondents was Gertrude Hemken, nicknamed Trudy. Another Chicagoan, Gertrude Hemken wrote 32 letters published in the magazine. In his book The Weird Tales Story, Robert Weinberg described them as "disjointed patches of baby talk nonsense." Nonetheless, they and she were popular. (1) As for authors of stories, Henry Kuttner (28) and Robert Bloch (26) were on top. Tom Cockcroft has compiled a list of letter writers to Weird Tales, published on the FictionMags website. That list is the source for my list. Once again, if my count is wrong, the fault is mine alone. If my count is correct, it's only as good as my source. Robert E. Howard by the way had nine letters published in Weird Tales. (1) In doing research for this posting, I came upon some speculation that Gertrude Hemken and Caroline Ferber were the same person. If that's true, then Gertrude would be the top writer of letters in Weird Tales. The heading for "The Eyrie," the long-running letters column of Weird Tales, drawn by Andrew Brosnatch and used for years after he was no longer associated with the magazine. Labels: The Eyrie, Who Wrote the Most. . . ? Who Wrote the Most Poems for Weird Tales? Although H.P. Lovecraft, Robert E. Howard, and Clark Ashton Smith were bested when it came to stories printed in Weird Tales, they were on top in number of poems. H.P. Lovecraft (1890-1937) wrote 43 poems published in the original run of the magazine (1923-1954). That number includes "Two Sonnets" from February 1939 and "Fungi from Yuggoth" (May 1944), a five-poem cycle. Clark Ashton Smith (1893-1961) followed closely on Lovecraft's heels with 39 poems, plus one under the pseudonym Timeus Gaylord. Robert E. Howard (1906-1936) is next with 35. Dorothy Quick (1900-1962) and Leah Bodine Drake (1904-1964) were the most prolific of women poets in Weird Tales with 24 each. As in the previous posting, I have used Jaffery and Cook's Collector's Index to Weird Tales as my source. And I have counted only those poems published in the original run of Weird Tales, 1923-1954. Howard Phillips Lovecraft, the most prolific poet in Weird Tales, in his eighteenth century mode. The drawing is by Virgil Finlay. Labels: Virgil Finlay, Who Wrote the Most. . . ? Who Wrote the Most Stories for Weird Tales? The original Weird Tales was in print from March 1923 to September 1954, 279 issues in all. Hundreds of men and women contributed to "The Unique Magazine." As far as I know, no one has counted their number or how many stories they wrote. Some writers sold a single story to Weird Tales, while others became stars, contributing story after story during the magazine's heyday. Three authors--H.P. Lovecraft, Robert E. Howard, and Clark Ashton Smith--are closely identified with Weird Tales, yet none was more prolific than Seabury Quinn (1889-1969), a lawyer and journalist who wrote over 500 stories in his lifetime. His works for Weird Tales numbered 159, of which fourteen were non-fiction. Most of those stories starred occult detective Jules de Grandin, descended perhaps from Sherlock Holmes and Carnacki the Ghost-Finder. One of Quinn's most admired stories was "Roads," published in Weird Tales in January 1938. 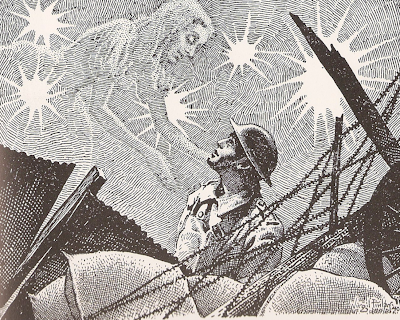 An unusual Christmas story, "Roads" appeared in print as the world marched towards war. Second to Quinn was August W. Derleth (1909-1971), who wrote 101 stories under his own name, plus 13 more under the pseudonym Stephen Grendon, and another 22 stories in collaboration with others. Derleth co-founded Arkham House, a publisher of hardbound weird fiction, much of it from Weird Tales. He was largely responsible for keeping H.P. Lovecraft's name in print after Lovecraft's death in 1937. Third in ranking is Edmond Hamilton (1904-1977) with 76 stories, followed by Robert Bloch (1917-1994) with 66. Only then do the big three show up on the list: Clark Ashton Smith (63), Robert E. Howard (54), and H.P. Lovecraft (49, not counting collaborations, revisions, and ghost-written stories). The most prolific woman among contributors to Weird Tales was Allison V. Harding with 36 stories, followed by Mary Elizabeth Counselman with 30. (There is reason to believe that Allison V. Harding was not a woman. I'll cover that possibility in a series of future postings.) In any case, following is a list, based on my count of titles in The Collector's Index to Weird Tales by Sheldon Jaffery and Fred Cook (1985). If my count is wrong, only I am to blame. If my count is correct, then it's only as good as Jaffery and Cook's list. Also, I have counted stories that appeared in the original run of Weird Tales, 1923 to 1954, and not in the revivals of 1973-1974 or 1981. Finally, as you can see towards the bottom of the list, the order might change depending on how you count. The same is true in the case of H.P. Lovecraft, who revised and ghost-wrote several stories without being given credit in print. As always, Lovecraft is unique. Seabury Quinn (1889-1969), the most prolific author in Weird Tales. Labels: Occult Detectives, Seabury Quinn, Who Wrote the Most. . . ? Who was the most famous reader of Weird Tales? You can make a case that it was Ward Cleaver, fictional father of Wally and Beaver in Leave It to Beaver. In a 1958 episode entitled "Voodoo Magic," Ward explains to June that there isn't anything wrong with the boys seeing a horror movie called Voodoo Curse. After all, he saw hundreds of horror movies when he was a kid. He also read Dracula four times. And he had a subscription to Weird Tales! One of television's greatest dads, shaped by Weird Tales! Ward was of course played by Hugh Beaumont (1909-1982), a journeyman actor who had been in movies since 1940. Beaumont usually played either a serviceman or an authority figure such as a policeman, doctor, or minister. He was also in several genre films and TV shows, mostly Western and crime dramas. He played detective Mike Shayne in three quickies from 1946. Beaumont also appeared in an episode of The Adventures of Superman, called "The Big Squeeze" (1953). His science fiction films include Lost Continent (1951), The Mole People (1956), and The Human Duplicators (1965). By the way, no one should mistake Hugh Beaumont for Hugh Marlowe, another long-time actor who appeared in The Day the Earth Stood Still (1951) and Earth vs. the Flying Saucers (1956). You can read more about Ward Cleaver and Weird Tales at a website called Television Terrors, here. 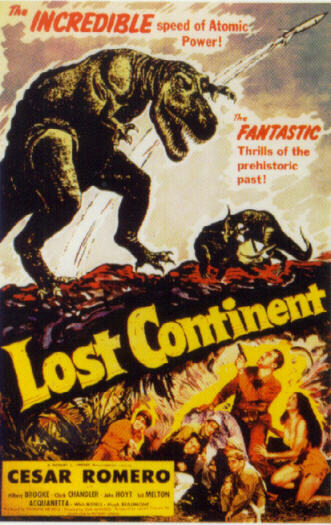 Lost Continent, from 1951, is a variation on the Lost World theme, used in countless tales by writers of fiction (and pseudoscience) and real-life adventurers. Hugh Beaumont played Robert Phillips. 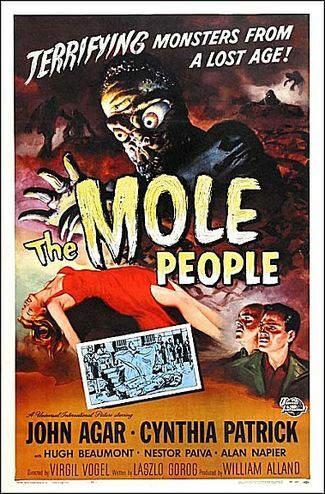 The Mole People is based on a different theme from fantasy fiction (and again, from pseudoscience), the subterranean civilization or hollow earth. 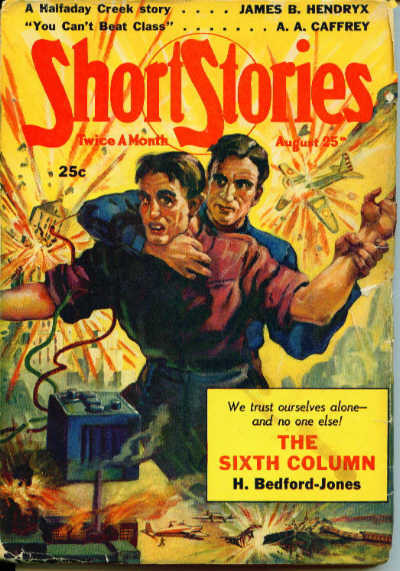 Readers of science fiction may have remembered the controversy over the Shaver Mystery, which had raged in science fiction circles in the late 1940s. Beaumont played Dr. Jud Bellemin and saw his name appear on the movie poster. Alan Napier by the way played Alfred the butler on Batman. 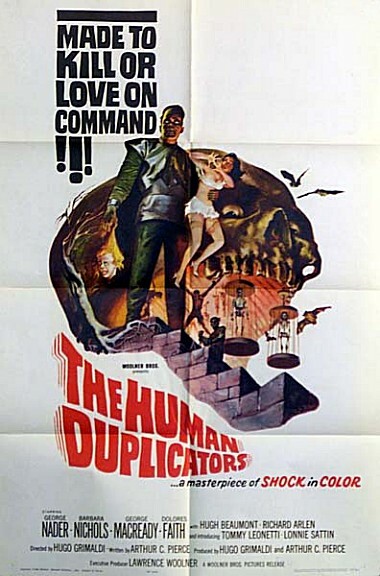 The Human Duplicators (1965) was Hugh Beaumont's last film. This time alien invasion is the theme. Judging by this poster, Voodoo Curse would have been pretty mild fare compared to The Human Duplicators. 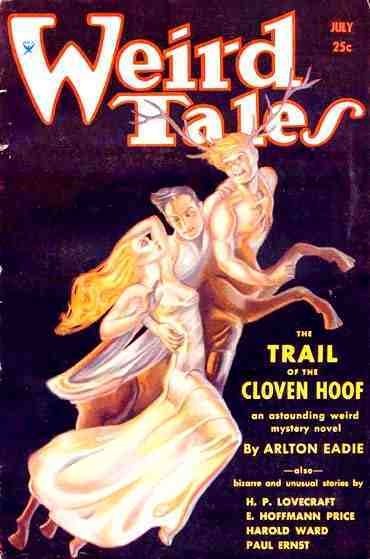 Thanks to MMH for the tip on Ward Cleaver as a reader of Weird Tales. Weird Tales, the first American magazine devoted exclusively to fantasy fiction, made its debut in March 1923, a mere four years and four months after Armistice Day, the end of hostilities in what was then called the Great War. One of the most disastrous events in human history had come to its end on November 11, 1918, yet the effects of the war would be felt for decades afterward, right down to the present day. The war and all its horrors were still fresh in the minds of Americans when Weird Tales appeared on the newsstand. Thousands of men who had escaped the battlefield with their lives were nonetheless damaged, in body and spirit. Their wounds ranged in severity from mended limbs and healed bullet wounds to the unspeakable tragedy of "the basket case," a term applied to quadruple amputees, who were carried around in baskets. There were of course wounds to the face and head: ears, noses, and jaws shot off; eyes gone; flesh mangled and burned. There was also a wound new to warfare, the chemical wound, inflicted by German gas attacks. For the first time since the Civil War, America was haunted by young men who under different circumstances might have been called monsters. Many years ago, I watched a television program about early horror movies. After World War I, Lon Chaney, Sr., "Man of A Thousand Faces," became a star, based on his ability to transform himself into hideous human creatures: the Phantom of the Opera, Mr. Hyde, Quasimodo. The program I watched made the point that audiences were prepared for Chaney's transformations because they had seen terrible wounds and mutilations in their own families or among their friends. Stories about ghosts, vampires, and werewolves have been told for centuries. But would Weird Tales have arrived when it did--would it have been read as it was--if it had not been for World War I? The first issue of the magazine included a weird tale of World War I, "The Grave" by Orville R. Emerson, included in the anthology The Best of Weird Tales: 1923 (1997). Doubtless other stories were inspired--directly or indirectly--by the events of 1914-1918. 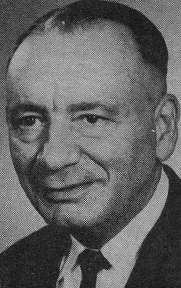 Jacob Clark Henneberger, founder of the magazine, was a U.S. Navy veteran of the war. Longtime editor Farnsworth Wright served as an interpreter of French in the U.S. Army. Many of the magazine's contributors were also veterans: Henry Lieferant, Loual B. Sugarman, R. Ernest Dupuy, Harold Freeman Miners, Pettersen Marzoni, R. Jere Black, Jr., Carlos G. Stratton, Forbes Parkhill. The list could go on. One contributor to Weird Tales, William Hope Hodgson, was killed in the war. How many more talented young men were killed before they could make their own contributions, not only to art and literature, but to the world itself? On this day, November 11, 2011, the ninety-third anniversary of the cessation of hostilities, we remember them and the sacrifices they made. An illustration by Virgil Finlay for A. Merritt's story, "Three Lines of Old French," originally printed in All-Story Magazine in 1919. The illustration is from 1940. Joseph Clemens Gretter lived a long and productive life, yet few readers knew him by anything other than his one word signature, "Gretta." The artist behind that signature was born on December 11, 1904, in the prairie country of western Indiana and grew up in Avery, Iowa. His schooling came at the Iowa Academy of Fine Arts, Chicago Academy of Fine Arts, and Art Institute of Chicago. His art career began in earnest in 1926 when he began drawing Hippity Skip Puzzles for the Chicago Tribune. During the lean years of the Great Depression, Gretter stayed busy illustrating series novels including the Ted Scott Flying Stories, the X Bar X Boys, the Air Combat Stories, and the Hardy Boys. He also made his way into comic books. In 1935, a former cavalryman and pulp fiction writer named Major Malcolm Wheeler-Nicholson put together a 36-page, black-and-white, tabloid-sized comic book called New Fun Comics, the first comic book made up of all original material and the second newsstand comic book ever published. New Fun Comics #1 (Feb. 1935) marked several other firsts as well, including the first original science fiction feature for a comic book, "Don Drake on the Planet Saro." The author was Ken Fitch, the artist, Clemens Gretter. 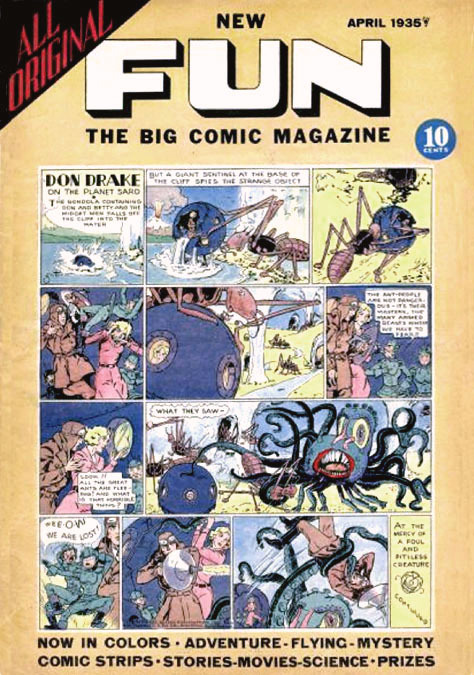 "Don Drake," probably inspired by Flash Gordon and Brick Bradford, ran in seventeen issues of New Fun and its successor, More Fun Comics, and even made the cover spot in April 1935. Gretter worked in comic books for many more years after that. His last known credited work showed up in Fatman, The Human Flying Saucer in 1967. By the early 1940s, Weird Tales magazine had moved to New York City. A change in editorial personnel, writers, and artists accompanied that move. The art of Margaret Brundage, Virgil Finlay, and others was increasingly rare on the cover of "The Unique Magazine." Other artists had been brought in to take their place, including A.R. Tilburne (another Hoosier) and Clemens Gretter. Tilburne produced ten covers in as many years between 1938 and 1947. Gretter on the other hand drew just one, for the January 1942 issue, an illustration unrelated to the stories inside. Clemens Gretter continued as a cartoonist and illustrator after 1940. Between 1941 and 1948, he ghosted Ripley's Believe It or Not! He drew his own fact-based features, In This World and In Our Time, syndicated between 1953 and 1988. In semi-retirement, Gretter painted portraits and wrote two books, The Genius of Man and Chain of Reasoning (1978). He also invented a building panel and was granted a patent for it in 1976. Gretter died on April 8, 1988, in Wilton, Connecticut, at age eighty-three. You can read more about Gretter and his comic book work in Ron Goulart's books, Comic Book Culture (2000), Great American Comic Books (2001), Great History of Comic Books (1986), and Over 50 Years of American Comic Books (1991). 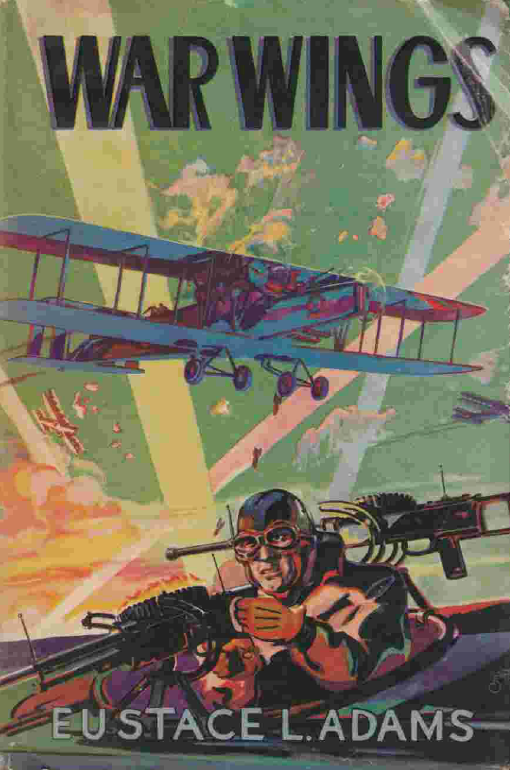 An exciting and colorful cover by Joseph Clemens Gretter for Eustace L. Adams' War Wings (1937), typical work from the artist for series novels of that era. "Don Drake on the Planet Saro" by Gretter and Ken Fitch, the first original science fiction story for a comic book. This is the cover of New Fun for April 1935. Don Drake could easily be the pilot on the cover of War Wings: their outfits are identical. A cover by Gretter for Short Stories, August 25, 1940, illustrating a tale by H. Bedford-Jones, a prolific pulpster and a teller of weird tales. Finally, Gretter's only cover for Weird Tales, from January 1942. Jay Wilmer Benjamin was just barely a pseudonym for Joseph Wilmer Benjamin III. He was born on October 11, 1902, in Harpers Ferry, West Virginia, son of a mail clerk. At age sixteen, Benjamin entered Hampden-Sydney College in Virginia where he became president of the student body, editor of the yearbook and the college newspaper, and a varsity basketball player, despite his small stature. He began his teaching career at Kimbridge High School in Virginia and in 1925 landed a job teaching English at Greenbrier Military School in Lewisburg, West Virginia. Benjamin also found a wife in Elizabeth Benjamin, who later wrote for Woman's Day and Good Housekeeping. Benjamin's known works for the pulps are few, but two have been reprinted since his death. For Weird Tales, he wrote "The Man Who Saw Red" (Nov. 1933), "Drowned Argosies" (July 1934), "Homecoming Day" (Mar. 1936), and "Eric Martin's Nemesis" (Mar. 1937). According to the Internet Speculative Fiction Database, the story "The Wizardry of Ndeze" (Jungle Stories, Winter 1953-1954) as by J.W. Benjamin, was also his work. Benjamin also wrote for Blue Book and the Associated Press. Benjamin signed his letters to "The Eyrie" as "Captain Jay Wilmer Benjamin." He later earned a promotion and was known to his students as "Colonel Ben." After retiring in 1971, Benjamin edited West Virginia Lawman and Firefighter and wrote a local history column for a newspaper. He was very active at his school, in his community, and in his church. Joseph Wilmer Benjamin III died on December 28, 1977, in a West Virginia hospital. Jay Wilmer's Benjamin's first story for Weird Tales, appearing in the November 1933 issue, was probably lost in the enthusiasm for C.L. Moore's debut story, "Shambleau." His next (July 1934) was among less conspicuous works, the exception being "Through the Gates of the Silver Key" by H.P. Lovecraft and E. Hoffman Price. The cover art was by Margaret Brundage. Thanks to Randal Everts for the photograph and other information on Joseph Wilmer Benjamin.